Josiah Chamberlain’s life’s work revolves around repairing people’s marriages. When his own is threatened by his wife’s unexplained distance — and then threatened further when she’s unexpectedly plunged into an unending fog — Josiah finds that his expertise, quick wit, and clever quips are no match for a relationship that is clearly broken. Feeling betrayed, confused, and ill-equipped for a crisis this crippling, he reexamines everything he knows about the fragility of hope and the strength of his faith and love. Love seems to have failed him. Will what’s left of his faith fail him, too? Or will it be the one thing that holds him together and sears through the impenetrable wall that separates them? This was my first book by this author and I was impressed at the emotional level that she was able to dig into. What do we have when everything else is lost or not what it seems? That is the question that Josiah must answer. It is a question that every Christian has the answer to, but the application can be difficult in the midst of tragedy. This was the story of one Christian struggling to answer that question and the hope that he found at the end of his journey. I was moved by his journey. This is not a feel good story or even one where you are looking for happily ever after (although I did feel that the story ended well). This was a flawed man coming to terms with his own selfishness and questioning the very basis of his faith. I didn’t like him at first. Then I felt sorrow at all that he went through. Finally, there was hope. It was a story that definitely dug deep into my emotions. I have not been through a tragedy such as Josiah and his wife experienced, but I learned quite a lot about people who do struggle with it. It made me appreciate my struggles and encouraged me. With God, we can absolutely make it through the trials. The encouragement that it offers of the hope we have in our faith. The ending came a little sooner than I expected, but I was happy to see the hope at the end. Would I recommend this book to others? I would. This story was a journey that reflected on how fragile our faith can be when faced with circumstances that seem insurmountable. It was well written and pushed me to examine my own faith, in a good way. Note: I received this book complimentary as a participant of the Litfuse Blog Tour. I was not required to give a positive review. All of the opinions I have expressed here are my own. Litfuse is having a giveaway for this book! When your life’s work revolves around repairing other people’s marriages, what happens when your own marriage begins to fall apart? Find out what happens to Josiah Chamberlain in Cynthia Ruchti’s new book, A Fragile Hope. Feeling betrayed, confused, and ill-equipped for a crisis this crippling, he reexamines everything he knows about the fragility of hope and the strength of his faith and love. Love seems to have failed him. Will what’s left of his faith fail him, too? Or will it be the one thing that holds him together and sears through the impenetrable wall that separates them? 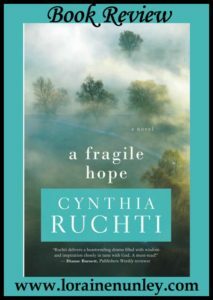 Celebrate the release of A Fragile Hope by entering to win Cynthia’s Sign of Hope Giveaway! Enter today by clicking the icon below, but hurry! The giveaway ends on May 3. The winner will be announced May 4 on the Litfuse blog. What age should the heroine be in an adult romance? Age is only a number - just give me a good romance.